If your lifestyle requires towing, hauling and other grunt work on a regular basis, then it sounds like you could use the power and capability of Toyota's new full-size pickup truck. The new Toyota Tundra is ready to take on the full-size truck competition head-on, with its gobs of power and towing capability, along with its ample passenger and cargo-hauling abilities. Drivers who are ready to explore the new Tundra near Winston-Salem, Greensboro and Winston-Salem, NC can visit Vann York Toyota in High Point today! 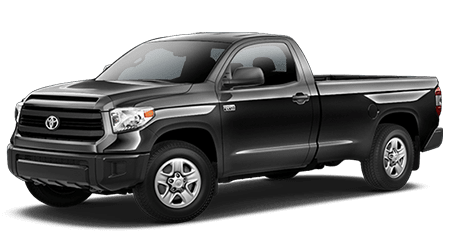 Find your new Toyota Tundra by shopping our online inventory now, or visiting our dealership location. We have 2016 and 2017 Tundra models in stock, plus a number of late-model used Tundra pickups for sale. With a choice of four powertrain configurations -- including two engines and two drive types -- you can find a new 2016 or 2017 Toyota Tundra full-size pickup truck that is tailored to your needs. Toyota's 4.6-liter V8 is the standard engine and generates 310 hp and 327 lb-ft of torque. For even greater performance and capability, Toyota makes available its mighty 5.7-liter V8 engine. Developing a commanding 381 horses and 401 lb-ft of torque, the 5.7-liter Tundra is ready to tackle any tough job! No matter which engine is selected, every new 2017 and 2016 Tundra truck is equipped with a durable 6-speed automatic transmission with intelligence (ECT-i), featuring sequential shift mode and uphill/downhill shift logic. Drivers can select either the standard rear-wheel (2WD/RWD) drive type with automatic limited-slip differential, or the optional 4WDemand part-time 4WD system, featuring an electronically controlled transfer case, an automatic limited-slip differential, and Active Traction Control (A-TRAC). Rugged yet refined is one way to describe the latest Toyota Tundra, thanks to its powerful engine and well-appointed cabin. Offered in multiple cab sizes, including Regular Cab, Double Cab, and CrewMax, the Tundra provides seating space for up to five passengers. Standard interior features include Entune Audio with a 6.1-inch touch-screen display, Bluetooth hands-free phone capability, rearview backup camera, and power windows and door locks. Vann York Toyota invites you to shop our complete inventory of vehicles here on our website, where you can also submit an online credit application and value your trade-in vehicle. At Vann York Toyota, we will keep your new vehicle running at peak performance for years to come, with our on-site Service Department. Test drive and explore the new Tundra at Vann York Toyota, serving drivers near Winston-Salem, NC.